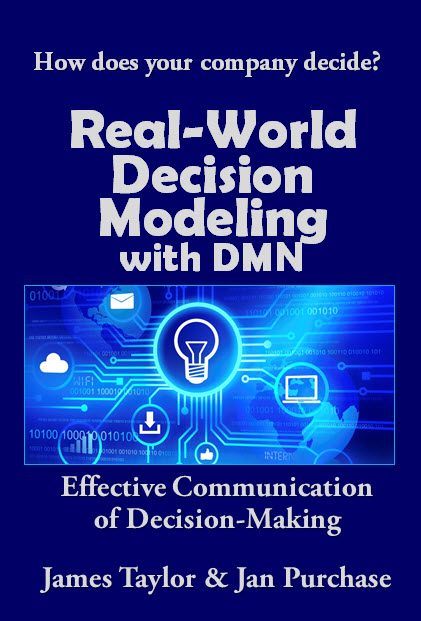 We are pleased to announce a collaboration with LuxMagi on a new book, Real-World Decision Modeling with DMN. The book is being written by leading decision modeling experts James Taylor, CEO of Decision Management Solutions and Jan Purchase, founder of Lux Magi. This comprehensive book will provide a complete explanation of the decision modeling technique and the DMN standard and of the business benefits of using it. Full of examples and best practices developed on real projects, it will help new decision modelers to quickly get up to speed while also providing crucial patterns and advice for more those with more experience. Real-world Decision Modeling with DMN will be available in print and Kindle versions. To learn more and to sign up to be notified when it is published, visit http://www.mkpress.com/DMN/.